Born in Schenectady, New York and raised in Rutland, Vermont, Greg knew he wanted to be a chef from age four. He started working in kitchens at age nine. Gabrielle’s passion for food developed at a young age as well, during summers spent in her grandmother’s kitchen in the Andean highlands of Ecuador. Both Greg and Gabrielle graduated from culinary school with honors, Greg in 1996 from The Culinary Institute of America in Hyde Park, New York and Gabrielle in 1999 from the California Culinary Academy in San Francisco. 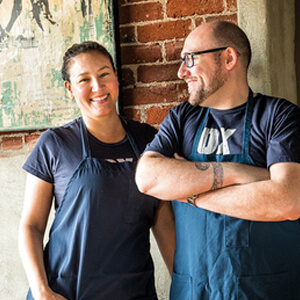 Together, the two chefs opened the Argentine-inspired Ox Restaurant in April of 2012, and their new Parisian-style French bistro, called Bistro Agnes, in January of 2018 in Portland, Oregon. They also released their debut cookbook, Around the Fire, in March 2016 (published by Ten Speed Press), to critical acclaim.